There was a correction on the oil market since the beginning of October after a strong growth in September that appeared to be more than 10%. The technical pattern is mixed at the moment. The WTI futures are testing the $50 key mark. Moreover, it has become a mirror support. The fundamental factors also don’t indicate a certain dynamics. The oil prices were supported by a high level of the OPEC agreement implementation earlier. They reduced the black gold production and restored the supply/demand balance. Not so long ago, they announced that an agreement on cutting the production between major oil manufacturers (including Russia) could be prolonged to the end of 2018.
oil consumption fell by -0.145 mln barrels per day. The expansion of the US exports and the Libyan raw materials restoration pressure the oil quotes. As you see, it is ambiguous at the moment. Indicators don’t show us some certain signals. The price has overcome 50 MA and MACD began to rise. 49.50-50.75 is the actual key trading range. I advise you opening deals after the price consolidates above/below those levels. 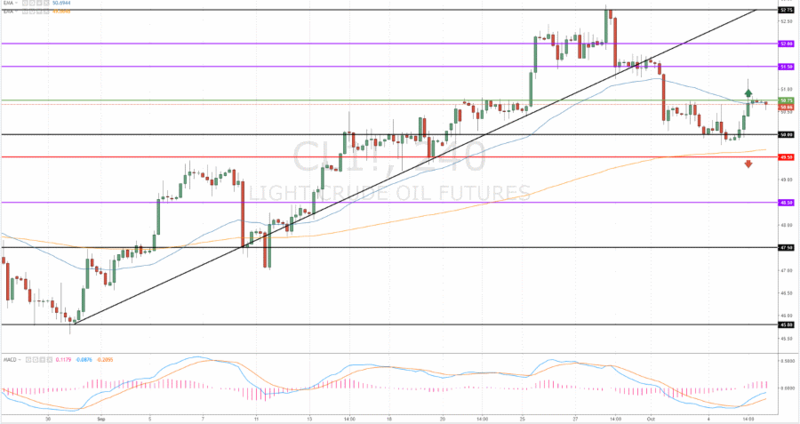 You can buy oil in case of the breakthrough and retest of the 50.07 local support. 50.50-52.00 is a goal for taking profit. The oil quotes may move to 52.75-53.00. An alternative option for bears. You may open shorts, if the quotes reach 49.50. The profit can be taken at the 48.50 level. The price can move to 47.50. All deals should be accompanied with trailing stops. In the past 24 hours Bitcoin has lost -1.19% and reached $5501.02287226. Open your trading account with the best cryptocurrency brokers on special terms today. In the past 7 days Ethereum has lost -0.6% and is now at $165.66063595. Have the most popular cryptocurrencies compared online 24/7.